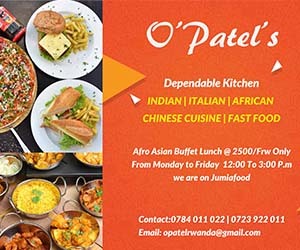 If Africa is to be on the table at a diner and not a waitress, then it is paramount to know where the continent has come from, says Prof. Patrick Loch Otieno Lumumba, the Director of the Kenya School of Law. Prof. Lumumba made the statement at the 4th symposium on peace, security and justice held yesterday in Kigali, Rwanda. “Visionary leaders are committed to values, exemplify a sense of personal integrity, radiate a sense of energy, vitality and will,” Prof. Lumumba said. “Under his leadership, Rwanda has exhibited robust economic growth, became the leading country in Africa in terms of service delivery, education and in health. Levels of corruption have decreased nationwide and high levels of institutional accountability, economic recovery, and national income rose while urban poverty has decreased,” Prof Lumumba said of President Kagame. He said many parts of Africa continue to endure suffering because of poor leaders, who have arrogated to themselves the monopoly of wisdom and have led their countries to pain, sorrow, and lamentation. The Minister of Justice and Attorney General, Johnston Busingye who officiated the event said that security and sustainable development are mutually inclusive and should be pursued with a comprehensive approach. “Good governance and sustainable development cannot exist in an environment that has no security,” Minister Busingye said. The annual event is organized by the National Police College (NPC) as part of the course requirements for the Police Senior Command and Staff Course (PSCSC) offered to senior police officers at strategic level. The symposium drew scholars, academicians, policymakers and other eminent officials with expertise in various fields whose work greatly influence the shaping of norms in the three areas of peace, security and justice. The seminar is integral part of the PSCSC masters program in Peace Studies and Conflict Transformation conducted by NPC in collaboration with University of Rwanda and UK College of Policing. Graduates from eleven African countries who attended the 5th intake and graduates from the Institute of Legal Practice and Development (ILPD) attended the event. The graduates were from from Ethiopia, Kenya, Malawi, Namibia, Sierra Leone, Somalia, south Sudan, Uganda, Cameroon, the Gambia and Rwanda. 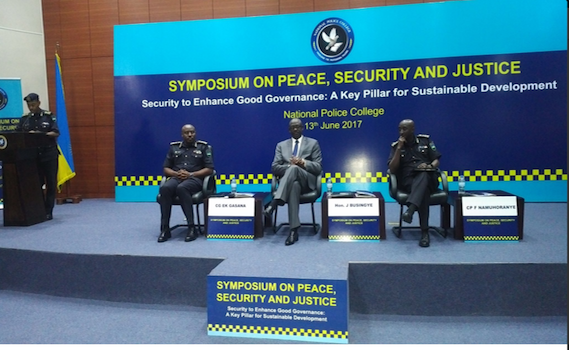 While speaking on challenges and prospects in ensuring peace and security for sustainable development in Africa, the Inspector General of Police (IGP) Emmanuel K. Gasana pointed out that although Africa is a continent with a lot of opportunities, it is also faced with many challenges that have a direct impact on the progress of the continent. “By the year 2020, the world will have 50 billion devices connected. The more these figures go up the more sophisticate cybercrimes become,” Dr. Hamadoun said. Globally, Hamadoun said, an estimate of $2.5trillion is lost due to cyber-related crimes; piracy is costing approximately $23billion and $250 lost in violation of intellectual property, but the more sophisticated part is that the criminals are not visible and can be in many places at the same time. Other speakers at the symposium included the Commandant of NPC, Commissioner of Police (CP) Felix Namuhoranye; the spokesperson of the Uganda Police Force Assistant Inspector General of Police (AIGP) Asan Kasingye who gave a lecture on countering the increasingly sophisticated terrorism-challenges and way forward; Letty Chiwara, the UN Women Representatives to Ethiopia, African Union, and Economic Commission for Africa who spoke about inclusiveness for sustainability-Women’s participation. Dr. Anita Ndoti Kiamba from University of Nairobi lectured about Security as a beneficiary and contributor to sustainable development-case study of the great lakes region. Education Minister Dr. Papias Manimba Musafiri made a closing remark and said that the forum presents an opportunity to share experiences and skills to combat emerging security challenges. “Law enforcers should embrace the use of ICTs as a crucial tool to reshape police operations in the changing nature of cybercrimes,” Minister Musafiri said.